The tangram is a mathematical game much used in the classroom, but also as simple fun. In this game you can develop your skills of logic, geometry and creativity. Tangram is simply a square divided into 7 geometric pieces with which you can get thousands of different images. Its origin is uncertain, but is thought to have been invented in China. Here you can learn how to make a tangram. The tangrams can be acquired, existing in various materials, such as wood or plastic. But if you do not want to buy, you can make a tangram in your house. Here you'll learn how to make a tangram. 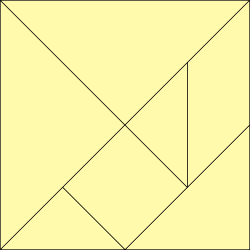 To make one tangram you gonna need paper (preferably thick, to be more resistant), scissors, pencil, ruler and eraser. Below you can learn how to make a tangram, step by step.